Have presented over 600 workshops and presentations at national, state, and regional organizations and agencies. Have served as consultant for numerous agencies and school districts. Six books. Two on Impact Therapy, one on creative counseling, and three on group counseling, and more than twenty-five publications in journals, magazines, and books. IMPACT THERAPY/CREATIVE COUNSELING: Conducted over 300 workshops demonstrating the principles of Impact Therapy and creative techniques. 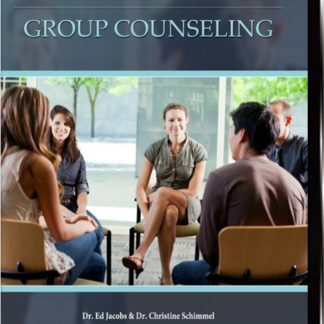 GROUP COUNSELING: Conducted over 200 workshops for school, correctional, mental health, and drug and alcohol counselors throughout the United States and Canada. DRUG AND ALCOHOL COUNSELING: Conducted over 75 workshops for D&A Counselors on group, individual, and family counseling. Consultant for adolescent, ACOA and DUI groups. COUNSELING THEORIES: Conducted over 150 workshops on “Putting Theories Into Practice.” Emphasis has been on REBT., Adlerian, Gestalt and T.A. theories for school, drug and alcohol, correctional, and mental health counselors. STEPFAMILY COUNSELING: Conducted over 20 all day workshops at the ACA national conventions, state conventions, and agencies throughout the country. MARRIAGE AND FAMILY COUNSELING: Conducted over 15 workshops at the ACA national conventions, state conventions, and area agencies. GRIEF COUNSELING: Presented a number of workshops dealing with how to conduct “grief/loss” counseling. Jacobs, E.E., Schimmel, C.J. Masson, R.L., Harvill R.L. (2016). 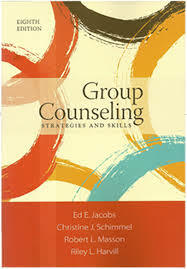 Group counseling: Strategies and skills (8th ed). Pacific Grove, CA: Brooks/Cole. Schimmel, C. J. & Jacobs, E. (2014). How to select and apply change strategies in groups. In R. Conyne (Ed. ), Group work practice kit: Improving the everyday practice of group work. Thousand Oaks, CA: Sage. Jacobs, E. & Schimmel, C. J. (2013). 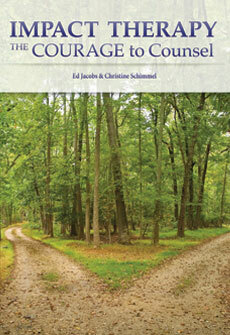 Impact therapy: The courage to counsel. Morgantown, WV: Impact Therapy Associates. Jacobs, E., & Spadaro, N. (2003). Leading groups in corrections: Skills and techniques. Lanham, MD: American Correctional Association. Jacobs, E.E. (1994). Impact therapy. Odessa, FL: Psychological Assessment Resources, Inc.
Jacobs, E.E. (1992). Creative counseling techniques: An illustrated guide. Odessa, FL: Psychological Assessment Resources, Inc.
Schimmel, C. & Jacobs, E. (2014) The toughest kinds of groups: Group leading when your members just don’t want to be there. Counseling Today. ACA magazine. Schimmel, C. & Jacobs, E. (2013). Counseling difficult students: Creative counseling techniques that really work. ASCA magazine. Schimmel, C. J, &Jacobs, E. (2011). Ten creative counseling techniques for helping clients deal with anger. VistaOnline. ACA. Schimmel, C.J., & Jacobs, E. (2011). When leaders are challenged: Dealing with involuntary members in groups. The Journal for Specialists in Group Work, 36(2), 144-158. Schimmel, C. & Jacobs, E. (2010) Don’t just sit there: engage the brain – using movement, writing, and creativity to increase effectiveness. VistaOnline. ACA. Schimmel, C.J. & Jacobs, E. (2010, February). Using multisensory techniques in counseling. Association for Creativity in Counseling Newsletter, 1(1), 13-15. Jacobs, E., & Schimmel, C.J. (2009). Processing multicultural exercises. In C. Salazaar (Ed. ), Leading multicultural groups.Association for Specialists in Group Work. London: Taylor and Francis. Stone, V. & Jacobs, E. ( 2008). Creative counseling techniques applied to the business world. Journal of Creativity in Counseling 3, 119-126. Jacobs, E. (2005). Individual psychology in group therapy (book review). Journal of Individual Psychology, 61, 90-91. Jacobs, E. & Schimmel, C. (2005). Small group counseling. In C. Sink (Ed. ), Contemporary school counseling (pp. 82-115). Boston: Houghton Mifflin Co.
Jacobs, E. (1998). What to do when more than one show up. Kentucky Counseling Association Journal, 17. Jacobs, E. & Smith, A. (1997). Listening is not enough. The Drug and Alcohol Forum. Jacobs, E. (1997). Impact therapy: An active, integrative approach to counseling. Global Visions for Counseling Professionals, 5. Jacobs, E. (1996). Impact therapy and career development groups. In R. Feller & G. Walz (Eds. ), Career transitions in turbulent times (pp. 317-322). Greensboro, NC: ERIC/CASS Publications. Jacobs, E. (1996). Creative counseling techniques that work. The Canadian Journal of Adlerian Psychology, 26. Jacobs, E. (1996). Impact therapy and group counseling. In S. Gladding (Ed. ), New developments in group counseling(pp. 13-16). Greensboro, NC: ERIC/CASS Publications. Kees, N., & Jacobs, E. (1990).Conducting more effective groups: How to select and process group exercises. Journal for Specialists in Group Work, 15, 21-29. Bloomer, P. B., & Jacobs, E. (1986). The child of alcoholic parents. In L. Golden & D. Capuzzi (Eds), Helping families help children: Family interventions with school- related problems(pp. 59-70). Springfield, IL: C. C. Thomas Publishing. Strother, J., & Jacobs, E. (1986). Parent consultation: A practical approach. The School Counselor 33, 292-296. Harvill, R., West, J., Jacobs, E., & Masson, R. (1985). Systematic group leader training: Evaluating the effectiveness of the approach. Journal for Specialists in Group Work, 10, 2-13. Strother, J., & Jacobs, E. (1984). Adolescent Stress as it Relates to Stepfamily Living. The School Counselor, 32, 92-103. Harvill, R., Jacobs, E., & Masson, R. (1984). Use of props in counseling. Personnel & Guidance Journal, 62, 273-275. Harvill, R., Masson, R., & Jacobs, E. (1983). Systematic group leader training: A skills development approach. Journal for Specialists in Group Work, 8, 226-232. Lutz, E. P., Jacobs, E., & Masson, R. L. (1981). Stepfamily counseling: Issues and guidelines. The School Counselor, 28, 89-194. Masson, R., & Jacobs, E. (1980). Group leadership: Practical pointers for beginners. Personnel & Guidance Journal, 59, 52-55. Jacobs,E. & Messing, J. (1977). Educating students to the process of change: Challenge for the school counselor. In D. P. Garner (Ed. ), (pp. 69-75). Career Educator Vol. II, Eastern Illinois University. Jacobs, E., Masson, R., & Vass, M. (1976). An easy way to get started. Elementary School Guidance and Counseling, 11, 68-71. Jacobs, E., & Croake, J. (1976). Rational-emotive theory applied to groups. Journal of College Student Personnel, 17, 127-129. Jacobs, E., Brown, D., & Randolph, A. (1974). Educating group counselors: A tentative model. Counselor Education & Supervision, 13, 307-309. Burck, H. & Jacobs, E. (1973). 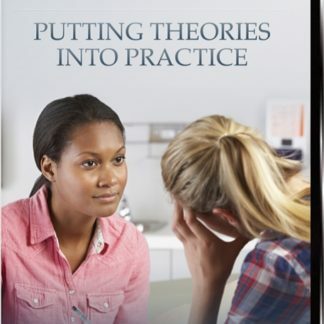 Teaching a course in counseling theories and practice: Description and evaluation. Counselor Education and Supervision, 12, 168-172. Holmes, D., & Jacobs, E. (1972). Comparison of student who sought help and their expectations of counseling in a university dormitory and counseling center. Journal of Consulting and Clinical Psychology, 39, 269-272.